But Nintendo Labo VR, the company’s first serious VR product, is hamstrung by a nagging feeling that its solution to “VR-on-Switch” is the very thing getting in the way of the fun. Its players are constantly urged to get out of VR, whether by lengthy cardboard build times, pint-sized VR experiences, or the sheer strain of having a 720p Switch screen filtered through a pair of glass lenses. The result is a serviceable take on VR, and I don’t blame any Switch fan for seeing its starting $40 price and biting. That’s as cheap a foray into “legitimate” VR as you’ll find (assuming you’ve already gotten $300 of fun out of a Nintendo Switch in non-VR ways). But that’s not a great caveat to slap onto a Nintendo experience. Labo VR is a rare case of the big N actively fighting with, and losing to, its own hardware in delivering anything close to magical. …which contains the plastic casing and glass lenses that are central to the whole Labo VR conceit. Nintendo really doesn’t want anybody setting fires with this thing. And some games require the Joy-Cons to be inserted into a Labo “mask,” like this bird design. Press on the cardboard buttons to “flap” its wings. Flapping will make the visible Joy-Con bob up and down, thus making the whole headset rock repeatedly on a player’s nose. Ugh. The Labo VR Kit’s biggest piece is this pump-action rifle. This elephant mask may be awkward to pose with one hand, but it works pretty well as a two-handed “painting” controller. These images are translated by a pair of glass lenses, and the resulting experience is a lot like Google Cardboard. Hold the box up to your face at a starting weight of 423g/14.9oz, press its plastic face to your nose, and move your head around—though you should only do so in a stationary or spinning chair. As a three degrees of freedom (3DOF) VR system, Labo VR will accurately translate your head’s rotation so that it looks like you’re doing the same thing in a virtual world, with two moving, stereoscopic images that allow you to perceive depth. But this illusion will break should you stand up or step in any direction. Your virtual self is effectively stuck on a tripod. 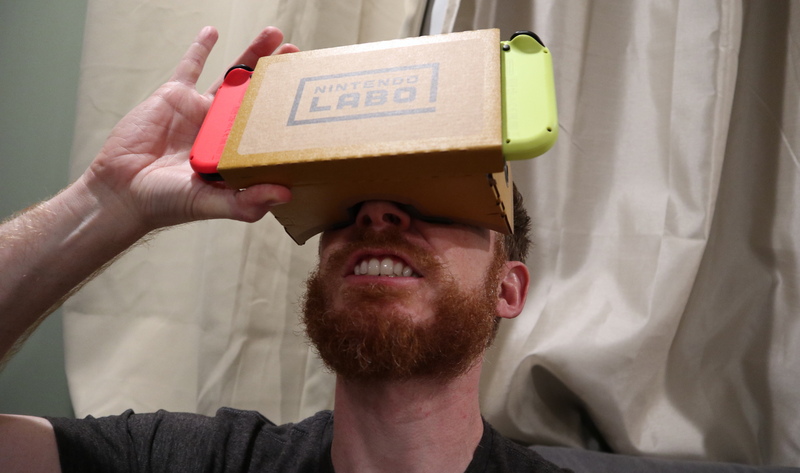 Unlike Google Cardboard or Samsung GearVR, however, Labo VR’s lenses interpret a different slate of pixels. Go all the way back to 2015, for example, to the first formal GearVR consumer launch, and you’ll find that its “minimum” phone was the Samsung Galaxy S5, equipped with a 5.1″ (129.5mm) “Super AMOLED” display with a resolution of 2560×1440 pixels. The Nintendo Switch, on the other hand, stretches fewer pixels (1280×720) across a larger 6.2″ (157.5mm) LCD panel. Thus, the Switch’s lousiness as a VR screen isn’t simply due to pixel resolution. OLED panels have long been favored by VR headset makers, owing to their “true” blacks, which are easier on eyes in a VR headset. Many of these OLED panels can have “low persistence” modes enabled, which reduces evident blur effects. The Switch’s LCD panel, however, doesn’t have any “fast-switching” capabilities to help with its obvious, annoying blur. Worse, because the Switch’s panel is so big, its effective VR display—those ovals—has to be smaller to translate to glass panels that are the right shape and size for human eyes. That last issue becomes most apparent when tricking a Nintendo Switch to run in “2D” mode while inserted into the Labo VR headset. You’ll get dizzy almost instantly if you look at this with both eyes open, but if you close one eye and try this out, you’ll instantly notice a lot more pixel fidelity fed into each eye. All of which is to say: a 720p panel is weak enough for VR, but the Switch is effectively running at a lower resolution than that to make Labo VR work. The science is still out on VR’s effects on children. And Labo VR’s approach is arguably more severe for kids’ vision than other systems. Some of the mini-games that don’t require any add-on masks to test out. Labo VR’s glass lenses translate this curved imagery so that players have a true “stereoscopic” image. But every game can also be played in a “pancake” mode. These tend to suffer from a very narrow FOV. …and boots the opening sequence to the system’s pack-in game. Sadly, Nintendo didn’t make videos for more of that system’s games. This video is tragically short, as well. This “VR car” game isn’t really a VR experience. Instead, you get a ground-level view of a third-person car. Most of Labo VR’s mini-games are disappointing in this way. Move this “VR UFO” around… but you view it from a third-person perspective and never move yourself. OK, here we go: fake like a goalie and block incoming soccer balls. This is actually a decent VR mini-game (though Sony’s PSVR version is much better). A few of the mini-games are just collections of toys that you can pick up and throw. It’s fine, but it’s no Garry’s Mod. Worse is this very limited “VR kitchen” sequence, which is embarrassing in a world where Job Simulator already did this concept a zillion times better. Most of Labo VR’s experiences are designed to work around its issues with blur, meaning that they’re short, they’re slow, and they constantly try to boot players out of the fun. Should you only build that default headset, you’ll get access to 32 VR mini-games. Less than half of these do anything meaningful with your VR perspective. Some of them revolve around a Mario-like avatar that you control with Joy-Cons (attached to the Labo VR headset, since you have to hold the whole thing with two hands). You’ll run and jump while managing a frozen camera with your head’s perspective, but only a few of these challenges offer any meaningful reason to look around—usually to find and activate items and platforms in your hidden visual periphery. Other “sports” mini-games do a similar thing with a frozen perspective, only to add a single floating hand to the formula—you’ll only hold the headset with one hand, then you’ll use your other to hold a Joy-Con as if it were a true hand-tracked controller. Spoiler: it’s not. By default, a standard Joy-Con only works in 3DOF sensing mode, and that weakness is exposed when these games ask you to emulate a golfing putter, a basketball shot, or a boomerang throw. The mix of these motions’ inaccuracy and an awkward one-handed headset grip make these mini-games downright criminal for Nintendo to include (especially for the company that practically invented motion-controlled sports gaming). The exceptions in this “basic” mini-game section include a solid pinball machine, a soccer-styled version of 3D Pong, and a soccer-goalie challenge. But all of these challenges are terribly short, and when you beat each one, they reset to make you replay the same brief challenge over and over. These highlights would have benefited from arcade-like remixes upon every completion.